The past few weeks have been very exciting for us. Earlier last month we had the underground conduits for the glycol piping to our cellar tanks put in. Later on after all the rebar was in place we finally (finally!) had the major brewery concrete flooring poured and raked—no more walking around on dirt! May saw the steam piping manifold fabricated on site, our natural gas line connected, sheetrock delivered to cover all the framing in our tasting room, brewer’s lab and gift shop, and the concrete floor finished and sealed. 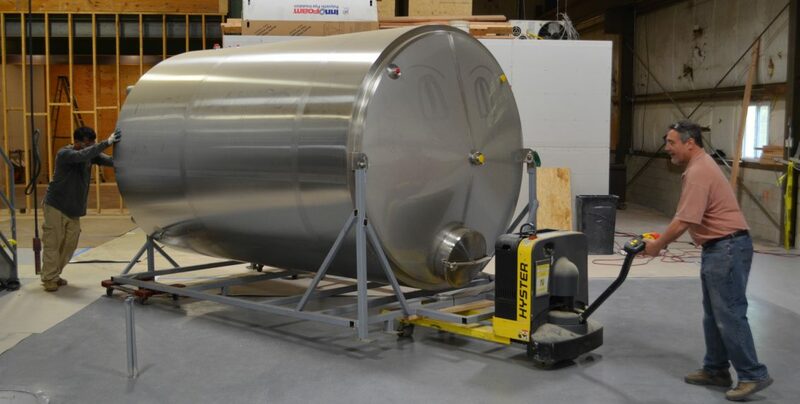 All of that work culminated in perhaps the most pivotal and symbolic progress to date: the first tanks rolling out on the brewery floor. It’s starting to look like a production brewery more and more each day. All of this progress has been prompting many of you to ask us: when will you be open? The answer is “soon.” We still have much work to do, but once we have committed to a date and the countdown begins, we will publicize it here and on our social media channels. Thanks for your patience! Previous Post Construction Update – April 2017 Next Post What’s in a Name?